With the Sochi Winter Olympics underway, the pride of competing nations is on the line. But in America, sometimes that’s not enough. Sometimes the experience is incomplete until you take that competition to the next level. This map shows how many gold medal winners hail from each state in the U.S. The data includes athletes from every Games since 1924, when the Winter and Summer Olympics were both held in France. The map has 51 rankings because it includes Washington, D.C. 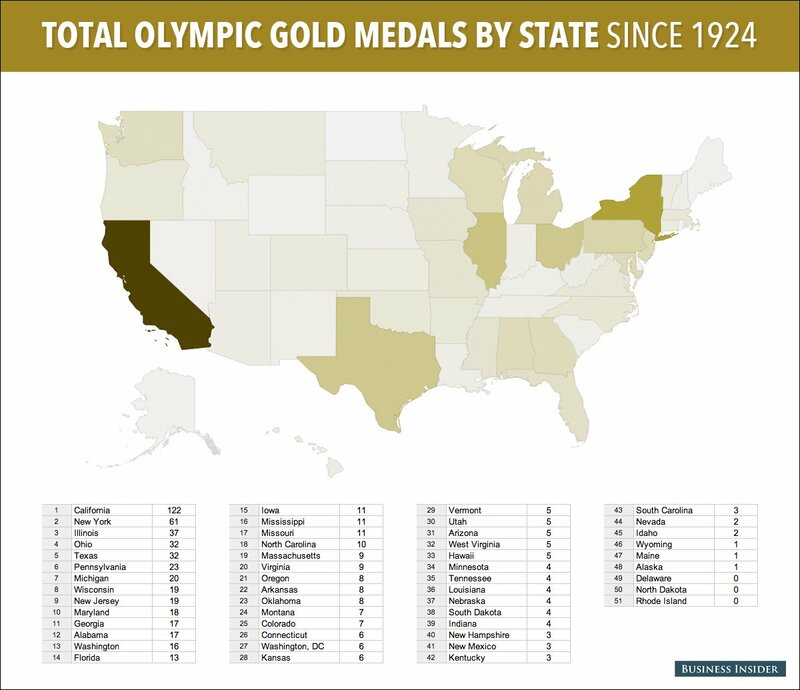 The background: Appropriately, the Golden State has won the most gold, outranking second-place New York by 61 medals. The rankings largely reflect population size, with 9 of the top 11 medal winners also ranking in the 11 most populous states. All 18 of 10th-ranked Maryland’s gold medals come from swimming legend Michael Phelps, the most decorated Olympian of all time. Looking forward to Sochi, the marquee American athletes hail from a variety of states. California has a strong presence with snowboarder Shaun White, while Illinois and Michigan have high hopes for speed skater Shani Davis and the Meryl Davis-Charlie White figure skating team, respectively. Promising alpine skier Mikaela Shiffrin is gunning to put Colorado on the map as well. Medal counts will be regularly updated here. The takeaway: Competition is a small part of what makes the Olympics such a great event. What’s truly powerful is the unifying camaraderie that brings people from different cities, states, and countries together to display the fruits of their hard work. In the end, regardless of who’s winning the state-by-state medal count, most will be too busy chanting “USA!” to give it much thought.